The next step is to cut out each individual part to it's exact size. A typical Hoosier Cabinet has over 170 individual parts so a cut list is needed to insure that all parts are cut to the correct size. 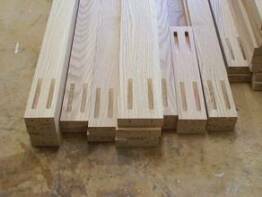 All styles (vertical pieces) and rails (horizontal pieces) needed for the Hooser sides, doors, and face frames are then routed or pocketed in preparation for assembly. A cope being routed on the end of a door rail. Screw pockets being routed with the pocket cutter. Screws are inserted in these pockets at assembly. Some of the finished pocket parts waiting for assembly.